CO2 HEAT PUMPS PROVIDE THE OPPORTUNITY TO UTILISE AND INTEGRATE RENEWABLE TECHNOLOGY WITHIN A PROJECT, SATISFYING A 52-WEEK DEFINED HOT WATER REQUIREMENT. CO2 scores high with respect to BREEAM and environmental standards. The gas is a natural refrigerant with a GWP (Global Warming Potential) of 1, signifying minimal risk. 1) The Renewable Heat Incentive (NDRHI) could give greater returns with respect to retrofit applications. 2) Hot water production within a 52-week period is preferable to seasonal heating only. This setup greatly reduces both cost and carbon emissions. To discuss how a CO2 heat pump could meet your project’s requirements, why not contact our team? Please phone 01253 685 145 or send an email to info@greenthermalenergy.com today. High-temperature heaters are available from either air & ground/water source. Using our CO2 heat pump technology, you can save energy and money whilst also act in the best interests of the environment. 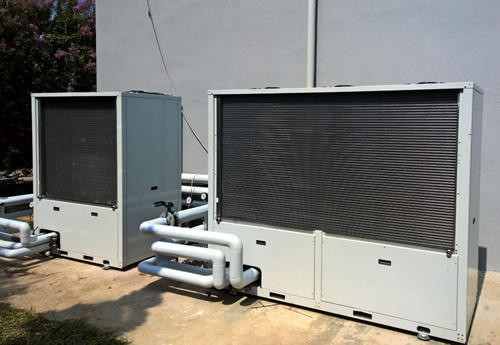 Click here to see how CO2 Heat Pumps can be utilised.